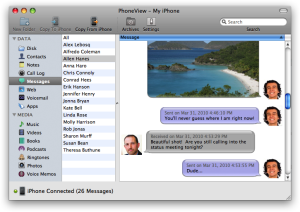 Save iPhone SMS and MMS Messages to Your Mac! I’ve looked for AGES for a way to backup my iPhone — the WHOLE shebang — without transferring my private information to a web-hosted service and then downloading it. Although there are several options for those with a PC, there are remarkably few for Mac-lovers. After trying several on for size, I found one that I like enough to recommend. I’m sharing to (hopefully) save others hours of research and hunting and trial-and-error to find a working resource. The name of the product is PhoneView and it’s a $20 investment. It will back up phone messages and recent call history (all great stuff for the small business owner). 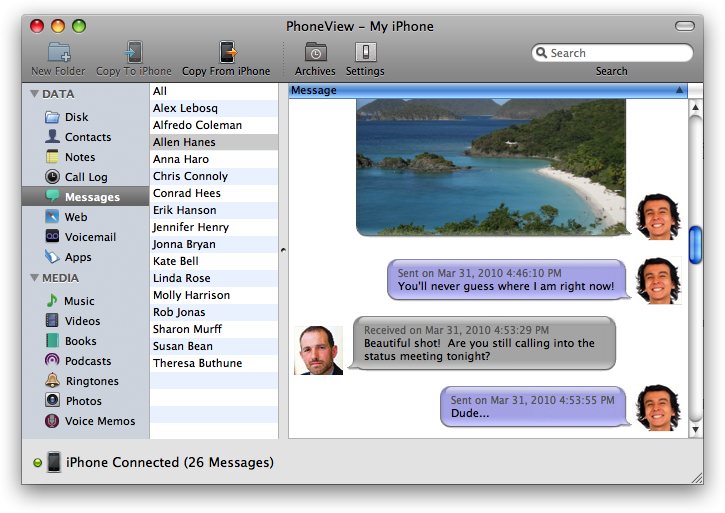 It also makes your iPhone “searchable” from your Mac, and sets it up to work as a portable disk drive. And — you can grab vCards straight from the iPhone and add them to your master list on your Mac. Nice! It does NOT require jailbreaking, or altering your iphone in any way, so it’s safe. This is the functionality that Apple SHOULD have built into iTunes, but didn’t. It works on the iPad too! iTunes won’t update Apps!!! iTunes error 400.